You've come to the right place. Growing watermelon is simple. Once they sprout, watermelon plants require very little maintenance. Most of the time, you just leave them alone and watch them grow. There are many different varieties of watermelon. In recent decades, seedless watermelon varieties have been developed that are easier to eat. When most people think of eating watermelon, summer picnics come to mind - a nice, cold slice of watermelon on a hot day is a real treat. However, there are lots of other ways to use watermelon. Because it has a very high water content, it's not possible to store watermelon for long periods of time. When raising watermelon, garden space is the main issue. Watermelons grow on vining plants. These vines spread out along the ground and can reach 15 feet in length or more. Since the plants get so large, it's not really practical to grow watermelons in containers. Newer bush watermelon varieties have become available in recent years. The vines on these plants may only grow 4-5 feet long. However, these bush varieties should still be planted in a traditional garden for best results. 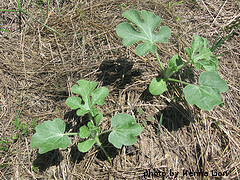 Watermelon seeds are usually sowed directly in the garden. It's possible to start growing seedlings indoors and them transplant them into the garden. However, watermelons don't like it when their root system is disturbed. Watermelons need to be planted where they get at least 6-8 hours of direct sunlight per day. Sunlight is crucial for fruit development. 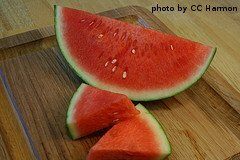 Most watermelon plants will produce 4-5 fruit per vine. The fruit is usually ready for harvest 75-100 days after planting, depending on the variety. Watermelons have a good resistance to disease and pest problems. 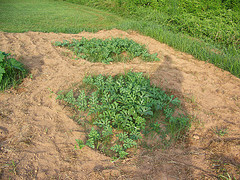 If planted in nutrient rich soil, watermelons don't usually need much fertilizer. They require a fair amount of water for the first few weeks of growth. When the fruit sets, you can almost stop watering the plants. As the fruit develops, the less water the plant gets - the better. Less water will increase the sugar content and concentration in the fruit, leading to sweeter, more crisp melons.